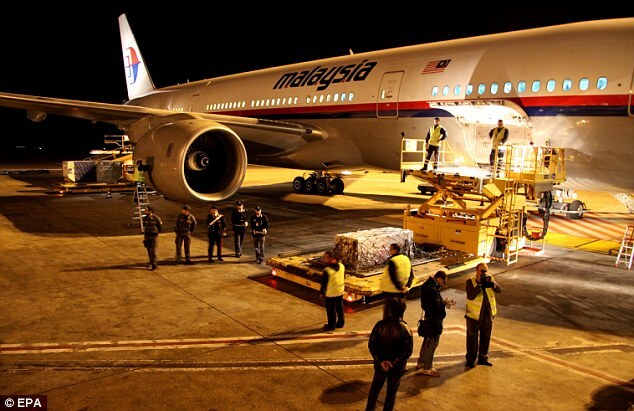 The body of MotoGP rider Marco Simoncelli has arrived back in Italy following Sunday's fatal accident in the Malaysian Grand Prix.Simoncelli's father Paolo and fellow rider Valentino Rossi were aboard the flight that arrived at Rome's Leonardo Da Vinci airport on Tuesday. They were greeted by Italian Olympic Committee president Giovanni Petrucci. Petrucci ordered a minute's silence before all football matches Sunday and players wore black armbands as a tribute to the young rider. Simoncelli died of chest, head and neck injuries after he lost control of his Honda and swerved across the track, straight into the path of American rider Colin Edwards and Rossi. 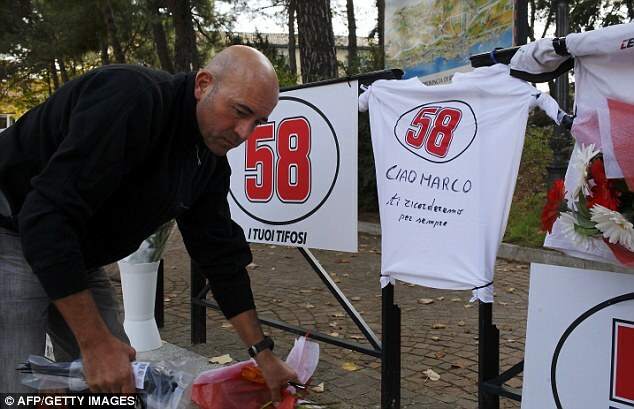 Rossi, the seven-time world champion, was a good friend of Simoncelli's. A public viewing of Simoncelli's body is planned for Wednesday in the city theatre of his hometown, Coriano, with the funeral scheduled for Thursday. 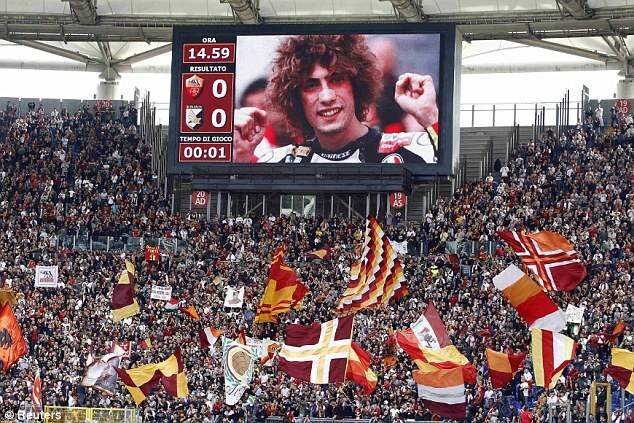 Rossi led the tributes for Simoncelli after he became the second high-profile death in motorsport in a week. Simoncelli was killed exactly a week after British star Dan Wheldon died at the IndyCar 300 in Las Vegas. 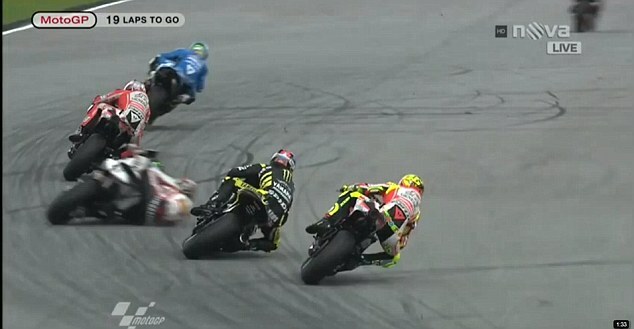 The Gresini Honda rider lost control of his bike on the second lap of the circuit in Sepang and was hit by Edwards and Rossi. The 24-year-old's helmet came off in the collision and he was taken to the medical centre for treatment, but died from his injuries. 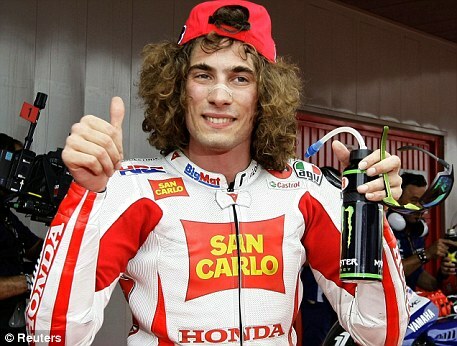 Simoncelli suffered 'serious trauma' to the head, neck and chest in the accident. 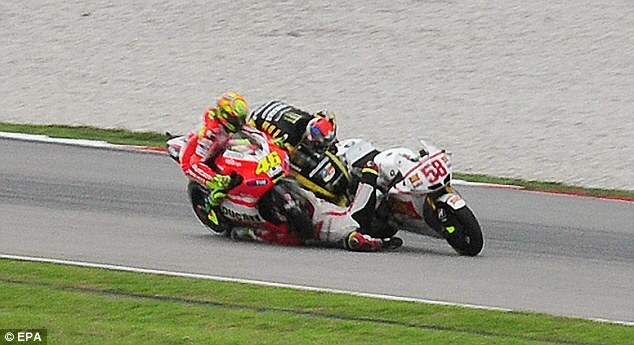 The organisers cancelled Sunday's race as soon as the extent of Simoncelli's injuries became apparent. 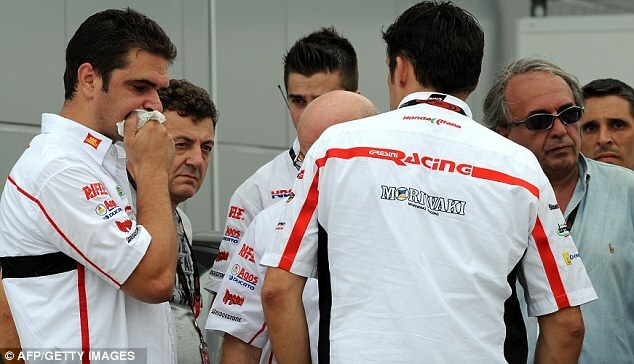 Gresini Racing has now withdrawn its teams from the season-ending races at Valencia. Team boss Fausto Gresini also confirmed his riders would miss the end-of-season tests which follow on from the November 6 races. 'The only certainty is that my team won't participate in the upcoming Valencia Grand Prix and in the tests programmed after the race,' Gresini told Corriere dello Sport. 'Everything happened so fast. I'm lost for words. I know our job is dangerous, that risk is part of the game, but you always hope nothing happens. 'When it does happen and you find yourself in the middle of it, everything changes, it's difficult to accept it. Rossi, who is struggling with Ducati this season, dismissed speculation that he might retire in the aftermath of the crash. 'I never said that. It was probably made up just to sell newspapers,' Rossi said. Spanish rider Dani Pedrosa had a dispute with fellow factory Honda rider Simoncelli earlier this season, but news of his rival's death left last season's championship runner-up reeling. 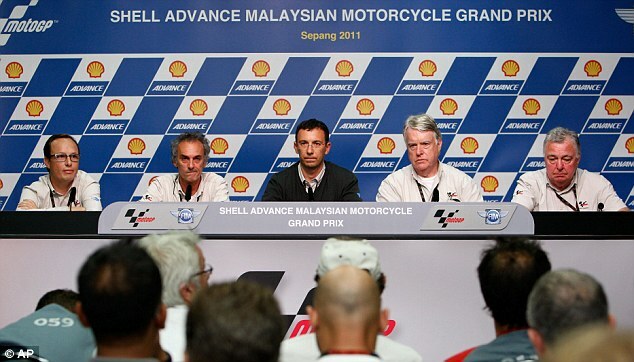 Repsol Honda's Pedrosa said: 'In a tragedy like this there is not much to say. I just want to give my condolences to his family and all the people who love him. 'I've been with his father and all we could do was to hug, nothing else matters. 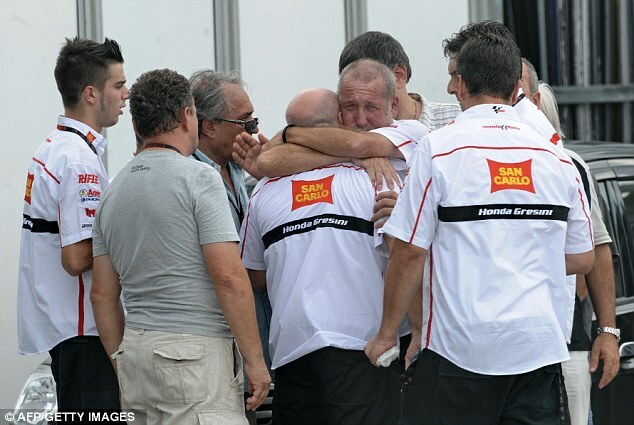 It was a fatal accident and everybody in the paddock remains in shock. Newly-crowned MotoGP champion Casey Stoner added: 'I'm so shocked and saddened by the loss of Marco. When things like this happen it reminds you how precious life is, it makes me feel sick inside. Speaking at a press conference following the tragedy, medical director Dr Michele Macchiagodena said of Simoncelli: 'Because of the crash he had during the race, in which he was hit by other riders, he suffered a very serious trauma to the head, to the neck and the chest. 'When our medical staff got to him he was unconscious. In the ambulance because there was a cardiac arrest they started CPR (cardiac pulmonary resuscitation). 'Immediately in the medical centre, with the help also of the doctor of our staff at the Clinica Mobile and local doctors, he was intubated and it was possible to take off some blood from the thorax. Simoncelli's compatriot and Repsol Honda rider Andrea Dovizioso said: 'I watched the images and I'm shocked: in a race you fight and push hard and disaster is often around the corner. Simoncelli, who won the 250cc world championship in 2008, clinching the crown in Sepang, stepped up to MotoGP in 2010 and he finished eighth overall last season. His death was the first fatality in MotoGP since Japan's Daijiro Katoh died from his injuries sustained at the 2003 Japanese Grand Prix. Tributes poured in for Simoncelli from both MotoGP and the wider world of motorsport. 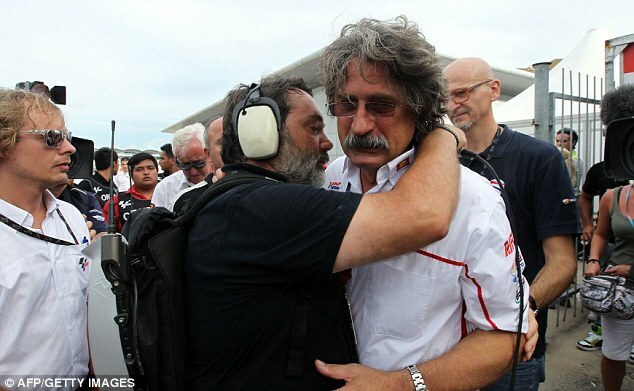 Formula One driver Mark Webber wrote on Twitter: 'R.I.P Marco A special talent that will be missed... Thinking of your loved ones, and all the motogp paddock..mark." A statement on the MotoGP official website read: 'On Sunday 23rd October, during the MotoGP race at the Shell Advance Malaysian Motorcycle Grand Prix at the Sepang International Circuit, San Carlo Honda Gresini's Italian rider Marco Simoncelli suffered a serious accident in which he received critical injuries. 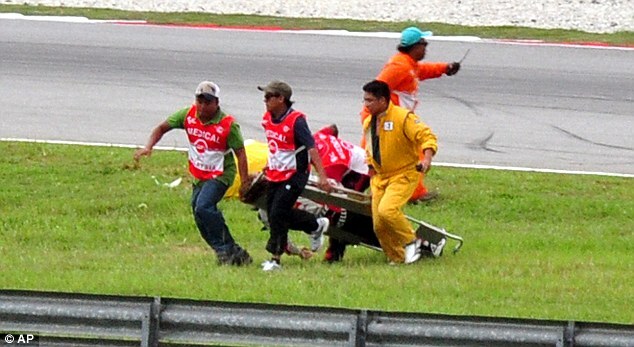 'The race was stopped immediately with the red flag and Simoncelli was transported by ambulance to the circuit medical centre where the medical staff worked to resuscitate him. 'Despite their efforts, Marco sadly succumbed to his injuries at 4:56pm local time. Simoncelli, who won the 250cc world championship in 2008, clinching the crown in Sepang, stepped up to MotoGP in 2010. A message on Simoncelli's Gresini Honda team website read simply 'CIAO "SUPER SIC"'. The Rizla Suzuki team wrote: 'All at Rizla Suzuki are deeply affected by today's tragic events and send their deepest condolences to Marco's family and friends during this time of great loss. Of the other riders involved, Edwards suffered a dislocated shoulder after being thrown from his bike, while Rossi managed to limp back to the pits. Meanwhile, Rossi's mentor has denied the Italian great will be retiring from the sport in the wake of his Simoncelli's death. Davide Brivio, Rossi's manager at former team Yamaha, responded to widespread internet rumours that the 32-year-old was too upset to carry on racing. 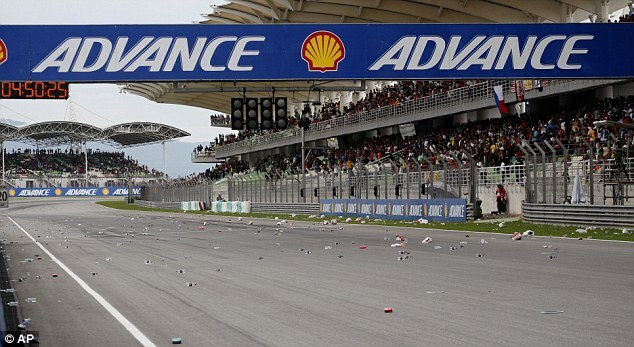 'Many are asking about Vale stopping races. This is absolutely not true and I'm sorry even that I have to explain it,' Brivio wrote on Twitter. 1987: Born in Cattolica, Italy on January 20. 1996: Runner-up in the Italian Minimoto Championship. 1999: Champion of the Italian Minimoto Championship. 2000: Claims a back-to-back title in the Italian Minimoto Championship and is runner-up in the European Minimoto Championship. 2001: Moves up to the the Italian 125cc Championship and wins the title in his rookie year. 2002: Wins the European 125cc title. 2003: Takes part in his first full season in the 125cc World Championship with the Matteoni Racing team. 2004: Joins the Rauch Bravo team and wins his first Grand Prix at a rain-soaked Jerez. 2005: Completes another 125cc campaign with the Nocable.it Race team and finishes fifth in the final standings. 2006: Moves up to the 250cc class riding for Gilera. Finishes the season in 10th overall with a sixth place finish at the Chinese Grand Prix his best result. 2008: June - Wins his first 250cc race at the Italian GP in Mugello in controversial circumstances when Hector Barbera crashed into him after Simoncelli appeared to try to block him off. October - Wins the 250cc World Championship after a successful season with Gilera with a third place finish in the Malaysian Grand Prix at Sepang. 2009: Finishes third overall in the 250cc World Championship behind Japan's Hiroshi Aoyama and Spain's Barbera. 2010: Moves up to ride in his debut MotoGP season for Honda. Finishes 16 of the 18 races en route to eighth place in the championship. 2011: May - Collides with Dani Pedrosa while battling for second in the French GP. The resulting crash saw Pedrosa break his collarbone and Simoncelli receive a ride-through penalty, eventually finishing fifth. 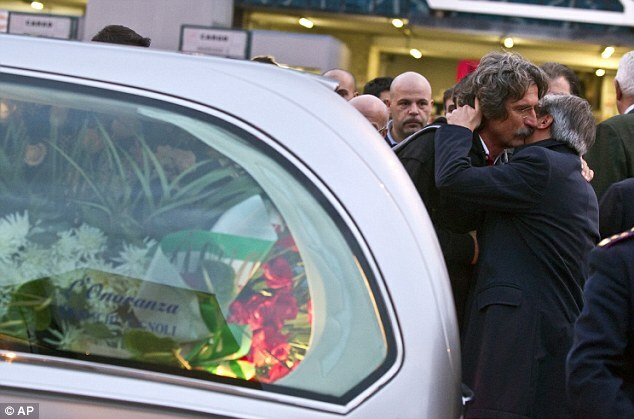 Simoncelli accepted he needed to re-evaluate his driving style and at times be more cautious. June - Claims his first MotoGP pole at the Catalan GP but a poor start resulted in a sixth placed finish. 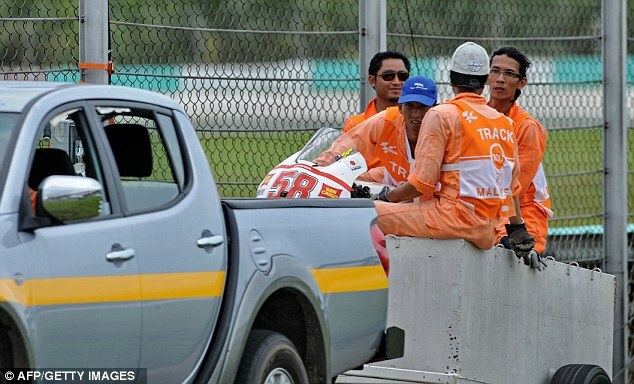 October 23 - Killed in a crash during the Malaysian GP in Sepang.